The recently launched 26.51 metre motor yacht, the Bugari F86, has had a central agency change and is now jointly listed for sale by Engel & Volkers with Northrop & Johnson. With exterior design and interior styling by Filippo Salvetti, she was built in GRP and carbon fibre to RINA class by the Italian yard Bugari and launched in September 2018. Accommodation is for eight guests in four cabins comprising a master suite on the main deck with a sea balcony, two VIP suites and a twin. All guest cabins have entertainment centres, Samsung LED television screens and en suite bathroom facilities while crew quarters sleep four members of staff aboard this yacht for sale. The open-plan main saloon has been styled to maximise the use of natural daylight, with full height windows and a folding sea balcony. The décor is light and contemporary, with a lounge area featuring comfortable furniture and an entertainment centre including a 49-inch Samsung LED television screen and a stereo surround sound system. The impressive deck areas include a flybridge boasting a Jacuzzi spa tub and a shaded dining area while the versatile aft deck features an extendable and submersible swimming platform that can also be used as a pier for the tender or the jet ski. Twin 1,900hp MAN diesel engines give her a cruising speed of 25 knots topping out at 30 knots and she is fitted with zero speed stabilisers. 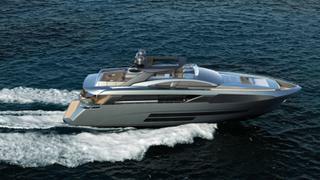 The Bugari F86 is asking €4,936,000.